Lazy River Pony is located in Corrales NM. 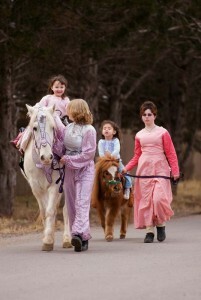 We are a kid oriented place offering a wholesome experience to the young horse person We have safe ponies with years of experience with young children. We offer vaulting classes, pony rides and year round weekend vaulting lessons. Also for the summer season, we will be holding a Summer Camp with concentration on equine activities and Bosque Education. We teach activities that increase strength and flexibility, improve coordination and balance, nurtures self esteem, challenge the imagination, improve rhythm and timing, enhance the respect for nature, and strengthen children for other sports. The most important skill we teach is how to fall off a horse.